Why We Want USB Port Lock With Password? Maybe you are working on home Windows PC or in an office, working on a virus free system and prevent any unauthorized access is you wanted. There are many cases of malware unknowingly infecting your computer via a USB. External intrusions can happen when you are leaving computers without an effective antivirus program or from the USB port, when an external USB drive is connected, with the intention of transferring data. Hence it’s important that you not only guard your PC online but also offline where a major threat can be the unauthorized use of the USB ports. Gilisoft USB Lock is a very handy USB Port Lock With Password tool that could prevent malware from infecting your PC as well for preventing unauthorized people from copying your sensitive data. Stop Data Theft & Corporate Spying, Prevent Viruses, Assure PC Privacy, Please Free Download it Now! Free Download USB Port Lock with Password – Keep your computer safe from harmful, virus infested files by restricting all USB access. 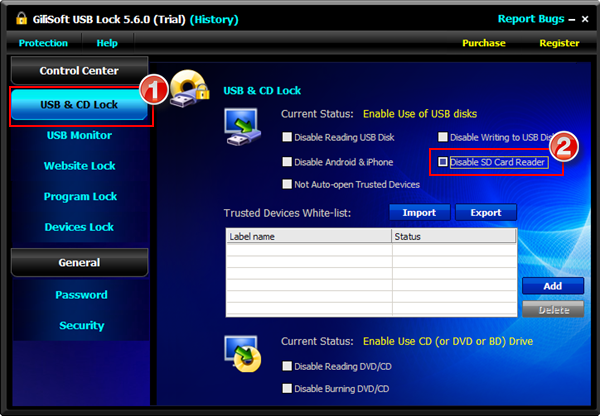 How to Block USB Port Lock With Password? 1). How to block USB Port Lock With Password to prevent anyone from copying files to the USB drive? The USB port is one of the prime areas where the virus can enter in the system. Is there a way to Password Protect the USB Ports in Windows 10 so that every time a USB disk is inserted a prompt comes out asking for a password before it can be used on the PC ? With Gilisoft USB Lock a simple tool that allows you to block and unblock your USB port to access. So blocking and unblocking of storage devices on any windows system now can be done very easily and effectively with a Windows USB Port Lock With Password. To sum it up, USB Port Locked With Password is a professional security application of its kind. If want disable usb port in windows using cmd, you need contact Gilisoft to request the command line version. how to remove it When you forgot its?